(7/25/2016) --- I have theory, in which we are going to play a game. Two games to be precise, Mario Bros and Donkey Kong; why? Both games are intrinsically united towards the narrative of the characters but is the Mario timeline that unifies all the main games together until the appearance of Mario Galaxy (Mario Wiki - Mario Galaxy) in which the timeline essentially splits into three; but the idea of three timelines itself can be more complex. The reason goes that after the recreation of the universe (yes, that is a spoiler) the timeline got diverted into three and joined by the the 8-bit era. The start of the timeline comes toward our world, a timeline where the first Mario or better known as Jumpman adventure takes place along with the first Donkey Kong. The second and last era is the 2000 in which the Galaxy games show up and opens to the last timeline which is the one that appears after the recreation of the universe and opens the possibility of the multiverse in which different characters from franchises not related to Mario compete between each other and is also on a time placement where WaLuigi exists, mostly as an extra dimensional being in which he has never show up on the main time frame but only on the ones towards competition. The third and last timeline is the most depressing in which Mario finally retires and conquers an island in which it could be considered the timeline in which Wario appeared for the first time and lead to the events of Wario World amd Wario Ware. We are going to speak about the multiverse in another entry and how the different universes collide into the Smash Brother's series of games. Each timeline or era is marked by an event but overall, the main division comes with the end of the universe, that exact moment is where it can bet set as a new moment of events in which Mario continues his adventures and in another option he just finish his life in a lonely island where the events of Mario Land take place after the fight with Bowser was over. To understand where everything began, we have to set the timeline in a place where we can see it and that is in an Earth similar as our own, it has some minor variation in which oxygen is a little bit higher because a giant gorilla rampages through the city of New York in which he kidnaps a woman named Pauline, the woman is the girlfriend of a man named Mario. 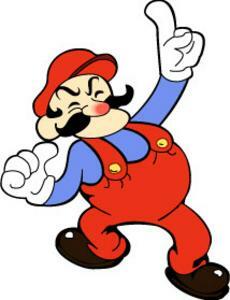 This Mario has black hair, is also short while his girl is brunette with blue eyes; a trait the second Mario would inherit but his brother Luigi got some of his father's look. The siblings didn't followed their father's foot steps instead they went and formed a plumbing business, but before that they were kidnapped during their birth by an unknown force. The twins ended up in Yoshi Island soon almost after being born, of course there is an allegory of the storch that we can say it didn't happened and it was a mere kidnapping act by an unknown force, that unknown force turned out to be Bowser when he was a child, thus setting the age gap between the twins and Bower in between five to six year apart, as Bowser when he was younger seemed to be already capable of speech and walking by himself, but the Koopa physiology hasn't been explored on any of the games but it looked as Bowser was highly inteligent to create a plan on stranding two infants in the middle of an island with dinosaurs. We have to understand that what we see on the Yoshi's Island versus the world where the twins were born are two separate places and probably two separate dimensions, who flows on the same time-stream; parallel worlds in other words. Back in NYC, a desolated Jumpman not knowing what happened to his kids takes the blame on Donkey Kong, and this is where the events of Donkey Kong Jr take place (Donkey Kong Jr - Mario Wiki) in which the child of the 8-bit era Donkey Kong, Jr (Mariowiki - Donkey Kong) in which after Donkey Kong Sr, went into a rampage on the third game, then the events within the Mario/ Jumpman timeline ended. As time passed by the twins didn't returned back to the prime Earth, but there is a division between what happened at the end to Mario, as within the last timeline, when the universe is recreated Mario keeps his adventure but there is a divergent point in which he finally retires and the adventures of Wario start and a second one in which he continues to be the protector of the castle and the Kingdom. But what happened to Jumpman, he became a toy maker and created a line of Mario toys and Donkey Kong continued certain rivalry until that Donkey Kong became old and retired on Kong Island. While at the end him and Pauline experienced some adventures of their own but not without missing their children. I see you like to play in old video games as I do. Wanted to reccomend you a Super Nintendo Emulator https://romsmania.com/emulators/super-nintendo for PC. It will remind to you how it was, when there was no gta5 or stalker games, there was only nintendo, you and your close friend.